Green beans, also called snap beans and string beans, are in the same genus and species as kidney beans, navy beans, and pinto beans but differ in that their pods are harvested for consumption along with their seeds. Green beans can be divided into two major types: bush and pole. Bush beans are about two feet tall, require no support, and bear heavily over a relatively short period of time. Pole beans, on the other hand, are trailing, require support, and produce their more abundant crop over a longer period of time. 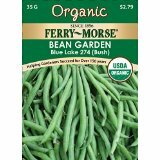 Typically, several sowings of bush beans or one sowing of pole beans will provide green beans for the summer. Green beans are usually self-pollinating and therefore breed true. Cross pollination can occur if bees are in the neighborhood so seed-savers should plant different bean varieties at least 100 feet apart. 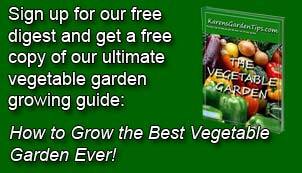 The seedlings of green beans do not transplant well so should be direct sown in the garden. The seeds, however, are sensitive to cold soil and rot rather than germinate at temperatures below 65 F. Plant when all danger of frost is past and the soil is warm. 1. To speed up germination, soak the seeds in tepid water for a few hours before sowing. Do not go beyond a couple of hours or the seeds will burst open. 3. Plant seeds “eye” down one inch deep. Space bush mean seeds two to three inches apart in rows twenty four to thirty six inches apart; space pole beans seeds seven to eight seeds around a pole. Seeds germinate in seven to ten days under optimal conditions. 4. Thin bush beans to eight to ten inches apart; thin pole beans to three to four plants per pole. 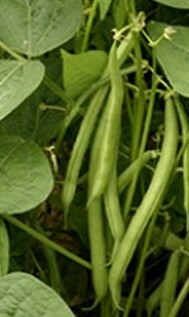 To buy green beans seeds from Amazon.com click here.